So, Im a graduate student of physics at NYU. I am studying experimental particle physics. The meaning of the word particle has changed dramatically over the course of the last century. In laymans terms, a particle is a small object, such as a dust particle or a particle of sand. In terms of physics, the term particle refers to the smallest objects that we are aware of, and usually those objects are fundamental (meaning that theyre not composed of other objects). Particles used to be molecules, then they were the atoms that made up the molecules, and then they were the protons, neutrons, and electrons that make up the atom. Now, in addition to the last three mentioned, they include a whole zoo of odd sounding objects that fly through space, come out of nuclear decays, and can be created in a collider. I work on an experiment known as ATLAS, which is one of several experiments that uses the Large Hadron Collider (LHC), which is located at a laboratory in Switzerland called CERN (the European Center for Nuclear Research). 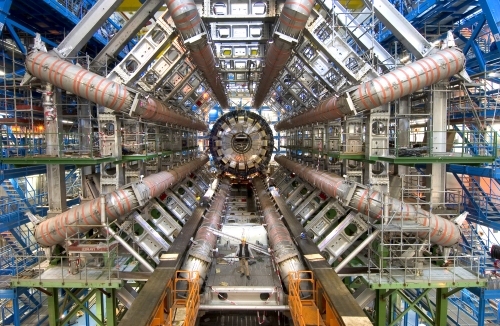 The LHC is a particle accelerator and collider (the biggest one in the world). It uses huge magnets to bend protons around a 27 kilometer long ring which is located 100 meters below the border between Switzerland and France. The protons when traveling around the LHC move at nearly the speed of light and have an energy of 7 Tev (Terra electron volts, meaning 10^12 electron volts). Each protons moves around the ring more than 10,000 times every second. These protons move in both directions around the ring, and at certain points they are made to collide with each other. They move in groups of about 10^11 protons called bunches, and at an interaction point bunches collide with each other once every 25 nanoseconds (which is pretty often). Even though the beam becomes very focused, most protons miss each other, and at each bunch collision, only about 50 of the 10^11 protons actually hit one another and interact (though most of these interactions are very boring). ATLAS is a giant machine that it located at one of these places where the beams of protons collide. It is a detector; it has nothing to do with the actual acceleration of protons nor with their collisions. More or less, its a giant camera that has many components which are designed to take pictures of different types of particles. When protons hit each other at the center of ATLAS, they blow up and send all sorts of thing flying out in all directions. Because of relativity and quantum mechanics, a collision of protons can create particles that werent there to begin with. So, even though we began only by throwing protons at another, we could end up with electrons, muons, protons, neutrons, light (photons), or many, many other particles whose names I dont care to list here. ATLAS is designed to be a sort of catch-all. It is a discovery machine, and the goal is that we will create particles that weve never seen before and ATLAS will detect them.